When in New Orleans, one must eat a po-boy sandwich. I'm pretty sure it's an unspoken rule. Po-boys are to Louisiana as pulled pork sandwiches are to the Carolinas, as a bagel with lox and a schmear is to New York City. Fortunately for us (or perhaps unfortunately) we were given suggestions for two different po-boy places. We couldn't decide, so we ended up going to both. Back to back. First stop: Crabby Jack's. In the process of writing this, I discovered it's owned a operated by the same guy as Jacques-Imo's Cafe. What are the odds? Anyways, Crabby Jack's is in a nondescript, not particularly nice part of town but they're well-known for having some of NOLA's best po-boys. 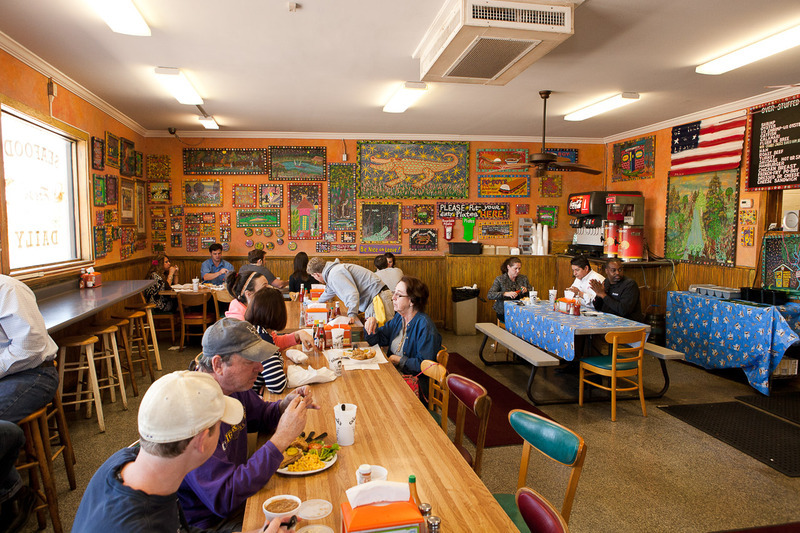 A small, simple place that looks like it's been around since the 1950s (it opened in 2002), Crabby Jack's has a wide variety of po-boy fillings along with some Creole classics like jambalaya, boudin, and fried green tomatoes. We ordered a regular-sized fried shrimp 'boy dressed (we found out that means with lettuce, tomatoes, pickles and mayo) to share. A few minutes later we were handed our butcher paper-wrapped po-boy. As giddy as children on Christmas morning, we unwrapped our sandwich and were greeted with a hefty po-boy packed to the gills with fresh, perfectly plump, lightly battered shrimps. Despite the whole fried-seafood-sandwich thing, it was surprisingly light (albeit delicious) and we were left hungry for more. Our second stop on the Stuff-Your-Face-Fest NOLA 2013 (we should have made teeshirts), was Parkway Bakery, just north of the French Quarter. Now this place is a legit New Orleans institution. They opened in 1911 and added the po-boy to the menu in 1929 when it was invented. They have been making po-boys for as long as they've existed! Pretty awesome. According to nearly every travel guide and website, they are the hands-down best place to get your 'boy. Parkway Bakery takes up almost half of a city block; it's huge. And it was packed with locals and tourists alike. We found the sandwich-ordering line and decided on the king-sized surf n' turf po-boy; a mega-sandwich with roast beef, golden fried shrimps and gravy. 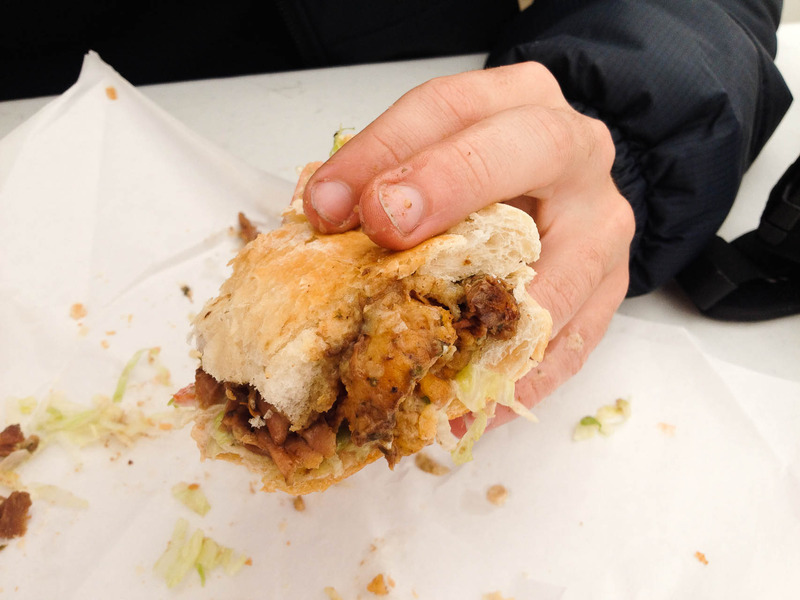 It was double the size of our Crabby Jack's po-boy and had twice the fillings. But it was incredibly deicious; tender fall-apart beef smothered with thick savory gravy topped with more perfectly fried and flavorful shrimp. The best of every imaginable world. So which po-boy wins? Parkway has the history and a really flavorful, classic and well-made po-boy, but it was hard to appreciate after having eaten one just before. 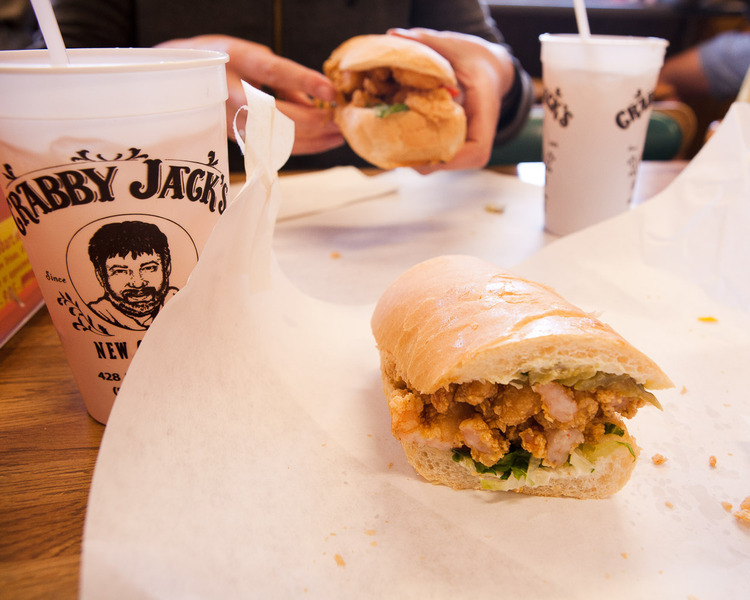 Crabby Jack's seems like more of a local spot with a more light-handed but nonetheless yummy po-boy. For me, it's a tie. You'll just have to try them both to decide your favorite. Special thanks to Emily P. (who suggested Eat the best po-boy in Louisiana.) and Rebecca R. (who suggested eat a shrimp AND oyster po'boy.) for making this blog post possible!